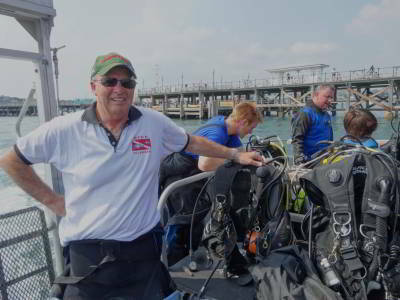 On our trip to the United Kingdom in August 2013, Kelly and my primary aim was to dive the German WWI wrecks of Scapa Flow, Scotland. 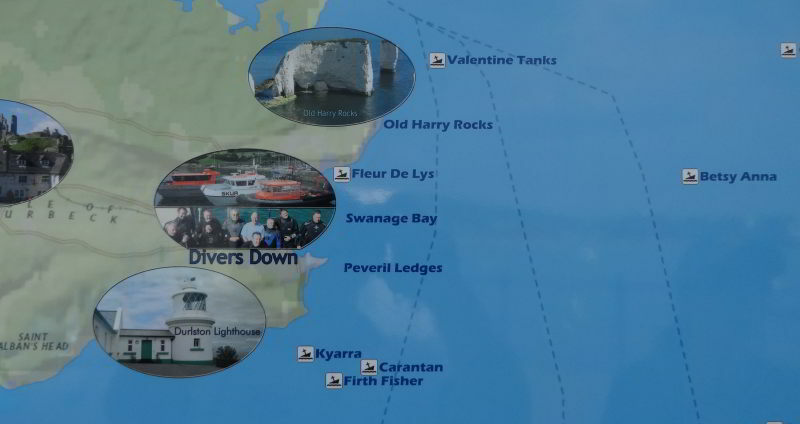 When we were planning the trip, one of the members of our dive club suggested that we should go to Swanage and dive the wrecks there. We looked into it and decided that this was indeed a good idea. 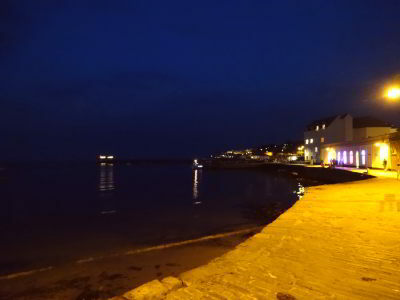 After diving Scapa Flow at the start of August, we travelled through Scotland, Wales and England, arriving in Swanage on the Monday of the Bank Holiday Weekend (26 August 2013). 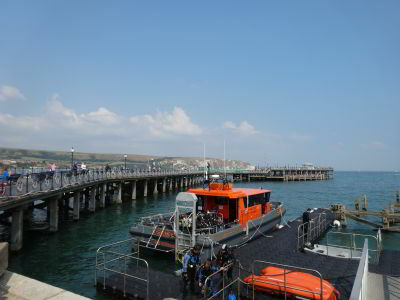 We went straight to the dive shop, Divers Down, which is located on the Swanage Pier. We ended up doing four dives here as planned, three on wrecks (HMAT Kyarra, SS Betsy Anna and MV Carentan) as well as one reef dive. The following information is provided to assist people thinking of diving there. Swanage is located about 170 kilometres south-west of London at the western end of the English Channel. It is a nice little seaside town which is very popular in summer with tourists. I must admit, I really liked the town, it has great beaches, clean water and lots to do for divers and non-divers alike. It was one of my favourite places that we visited in the UK. The easiest way of course is to use your car to travel from wherever you are. There are trains from London's Waterloo station to Weymouth which is stops are Bournemouth which is only 20 kilometres away by the most direct route. From here you can catch a bus, but this is very slow (90 minutes). I think a car would be essential, especially considering the need to get from bus station to accommodation to dive shop etc. There is a huge amount of accommodation in Swanage. There are bed and breakfasts, hotels and houses. We stayed in a nice bed and breakfast in a street that ran back off the main beach. This was within easy walking distance of the town. 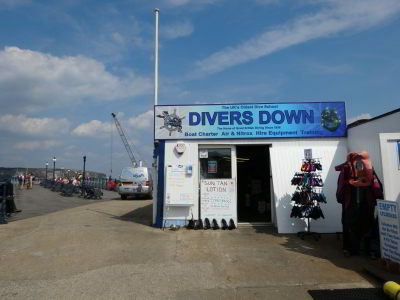 We used Divers Down dive shop which is located at the start of the historic pier at the southern end of the town. The shop is on the end of a concrete approach to the pier which can be driven down. You need to pay to park your car there (£8.50) and also pay for each person (£2.50) who goes on the pier. We fluked parking on the pier on the first day and got there early enough on the next to get a spot close to the shop. Otherwise you need to drop your gear and park in a parking area a few hundred metres away. The Divers Down is a very well set up shop, with compressor and everything you need for your diving needs. We hired tanks and weights and had no problems at all. Tanks are steel and I used a 15 litre and Kelly used a 12 litre. After getting our tanks and weights, we went behind the shop and set up our gear overlooking the floating wharf where the Divers Down boats load. They have three dive boats, all very large catamarans. These are the best dive boats I have ever been on, better even than the large ones I used in Fremantle, Western Australia. They have heaps of room, diver lifts and protected cabins. They are also relatively fast. Once geared up, you take you gear down to the boats and load. When it is time to go, you get on board and you get a pretty good brief about the boat and the diving. After the first dive, you come back and have a surface interval and then head out again. There are a couple of food places within walking distance of the pier, so this is the best option. The cost of the diving, including the hire of tanks and weights was very reasonable. For four dives each, we paid £264 (AU$470). This works out at about £33 each dive, under AU$60 a dive. There are numerous dive sites here, mostly shipwrecks. The map below only shows a few of the wrecks in the area, but it gives some idea of the sites that can be dived. Most dives require slack water. As the area is at the southern/western end of the English Channel, the currents can be very strong. A plan would be to have low or high water at about 8 or 9 am for the start of the diving. This would let you dive early morning and late afternoon. We dived three wrecks, HMAT Kyarra, SS Betsy Anna and MV Carentan and one reef dive. The Kyarra is especially a great wreck, one of the best I have done anywhere in the world. Click here to see links to the dives. If you like fish and chips, you will have plenty of places to eat. There are also a few pubs, we ate at the White Swan Hotel one night, it was very good and reasonably priced. The other night we ate at the Old Brick Pizza House which was part of another pub. This was the best pizza we had in the UK. There are lots of other places where you can eat. If you are visiting from overseas, I can thoroughly recommend spending a few days at Swanage and diving as many of the wrecks as you can. If you are from the UK or Europe, you should look to travelling there as often as you can. Dive clubs would have a great time here, a week would be great.